I've been aware of the existence of the Tefal ActiFry for some time. 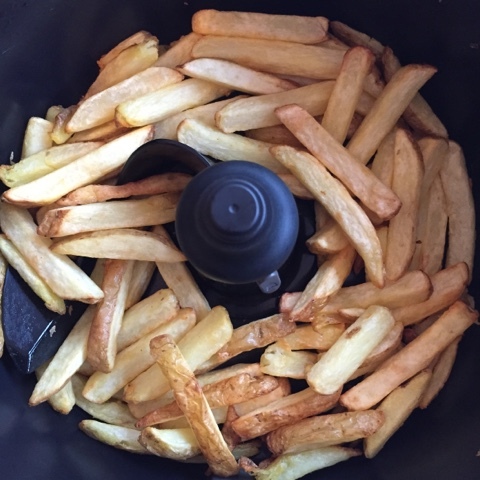 A magical machine that cooks chips with very little oil. That's pretty much all that I knew. However as intrigued as I was by the concept I didn't think it would be worth the cost or worktop space purely for cooking chips. This was until Tefal got in touch and asked me if I'd like to take part in their #ActiFryDay challenge and replace a Friday night takeaway with a healthier ActiFried alternative. 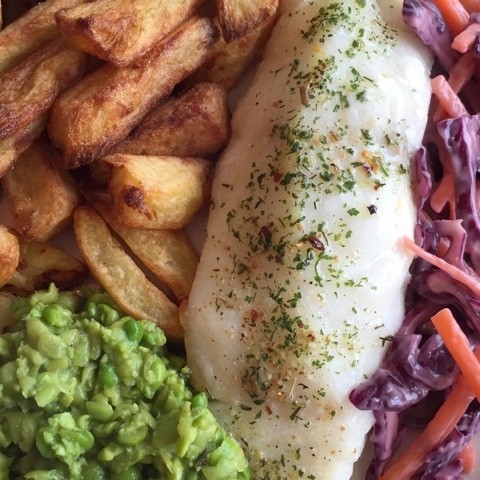 I was surprised to learn that in addition to chips I'd be able to cook up a whole range of takeaway favourites. Sweet and Sour Pork, Lamb Kebab, Chicken Tikka and Beef and Vegetable Stir-fry were among the surprising variety of ActiFry recipes at my disposal. 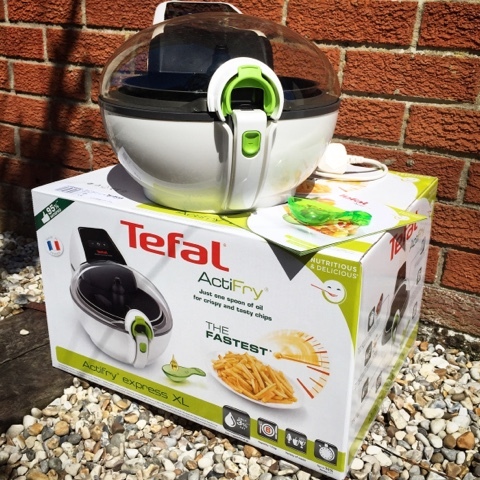 The Tefal Actifry Express XL duly arrived (rrp £249.99). It's a bit of a monster and looks somewhat like an alien spaceship. The first couple of times I used it I diligently put it back in its box, however this has now been binned and it sits on a shelf in the utility room. Much too big to have out on the worktop at all times in my opinion. Of course the first thing I had to make was chips. I used Scottish Rooster potatoes as that's what was under the sink. I excitedly tweeted a photo of them cooking only to be told that they were no good. I'd normally take such a disparaging comment with a pinch of salt (and lots of vinegar) but it came from Calum Richardson, owner of the award winning The Bay Fish & Chips in Stonehaven. He explained that unfortunately Scottish tatties don't make good chips as they have too high starch and sugar content. He also advised me to thoroughly wash them once chopped and that the varieties to look out for were English Maris Piper or Markies. Armed with this insider information I went shopping and tracked down some Maris Pipers. Having mastered the basics it was time to push the potatoes aside, take up the #ActiFryDay challenge and create a healthier takeaway. A survey by Tefal revealed that Brits are consuming well over half a billion takeaways a year. Based on the nations favourite takeaway dishes, this suggests we could collectively be eating up to 12,400 tonnes of saturated fat. 1 in 7 of us are eating 2,900 calories per takeaway at least once a week. Scary statistics! 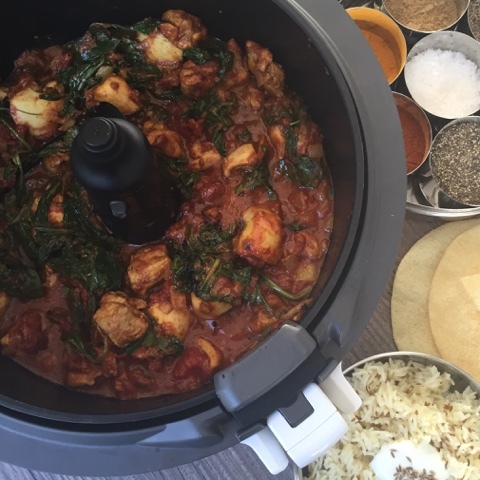 By cooking Chicken Tikka Masala in a Tefal Actifry the saturated fat content is reduced from 17.4g in a typical takeaway portion to just 1g per serving. 1. In a large bowl mix the Tikka Masala paste with 4 tablespoons of yougurt. Add the chicken in the coat then cover. Leave the marinate in the fridge for two hour or overnight. I was really impressed with how my curry turned out. The hot air and oil combination gives some delicious charring on the edges of the chicken and being able to get on with other things in the kitchen whilst the curry took care of itself was a real bonus. I used rapeseed oil which worked really well and added in half a bag of spinach that was lurking at the bottom of the fridge for the final couple of minutes. Completely forgot about the sugar and lemon juice! Photo here is from before the yoghurt was added so that's why it's so dark in colour. I've still got lots of experimenting to do and from a quick Google search it seems that I can cook pretty much anything in an ActiFry. Still to be tried are sausages, frozen oven chips, risotto, stir fry and on the menu for later this week are these Parmesan Crusted Chicken bites from Sarah at Taming Twins. This will be my first attempt at making something without the paddle. If you are an ActiFry aficionado please do leave any hints, tips or meal suggestions in the comments as I'd love to try them. Happy FryDay! 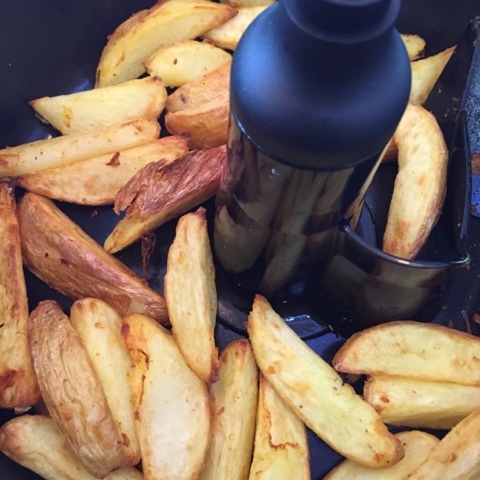 Disclosure - I was provided with a Tefal Actifry Express XL for the purpose of this post. I was not obliged to review positively in return. All views expressed are my own. This is not a paid post. This looks delicious! I've never tried an Actifry appliance before. Looks very handy. I initially thought that it was only for chips but I've been really impressed with its versatility. 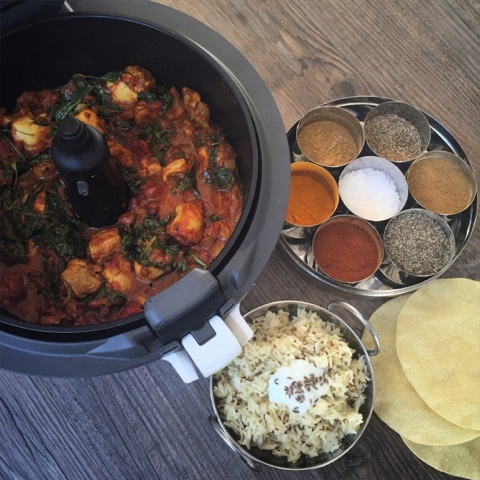 I love the idea of using the Actifry to make a chicken tikka. 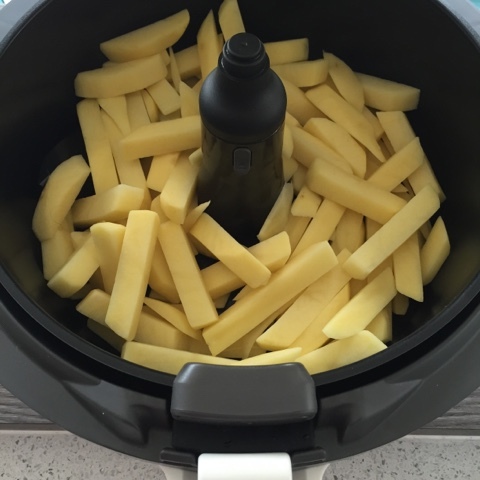 I haven't tried the Actifry yet but I'm always amazed by the pictures of how good the chips are! The chips are only the tip of the iceberg, it can cook so much more given the chance. I haven't tried roasted vegetables yet, must add that to the to do list. This XL model is designed to cook meals for 6. It looks very space age. Your chips look delicious, so it obviously works. Space age is definitely the right terminology for its looks and the chips taste as good as they look. I actually own an air fryer like that, but I'm ashamed to admit that I've never ventured much away from making chips, and air frying chicken with a bit of seasoning. I love that you made a whole meal in yours - I see now how very limited I made myself with ours! Love this recipes -can't wait to give it a try! I think we are all a wee bit like that with so many kitchen gadgets not used to their full potential. 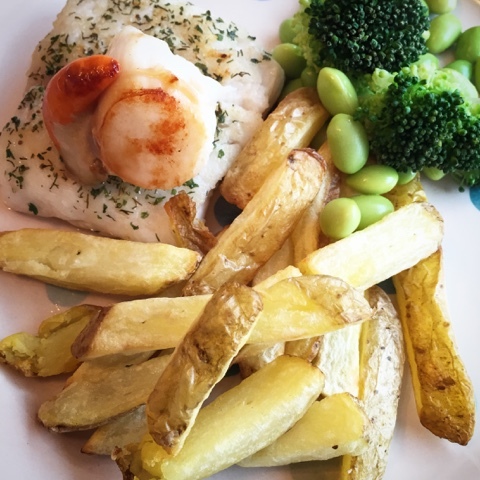 Well worth checking out the ActiFry website for lots more recipe ideas. hi i have just got a actifry and have made a panang curry i was wondering if you removed the turning plough thing then you made this curry or if it was turning the curry , as i found my chicken got colour but obviously when it turned it went into the sauce. Yes I kept the turning paddle in for this recipe. You really only need to remove it for something that would break up when constantly being stirred.